The Collab Blog: New connections! New Inspiration! As I wrote in a previous post, attending conferences and making new connections can be very energizing. That is exactly what I experienced at iEngage-Berwyn! 1) I was inspired by students! Check out these students who created an interactive virtual tour of their middle school using TouchCast. They realized that incoming students from the elementary school were nervous about the transition to a new school, and they set out to find a way to help those students; to ease their anxiety and help them feel connected before the start of the new school year. 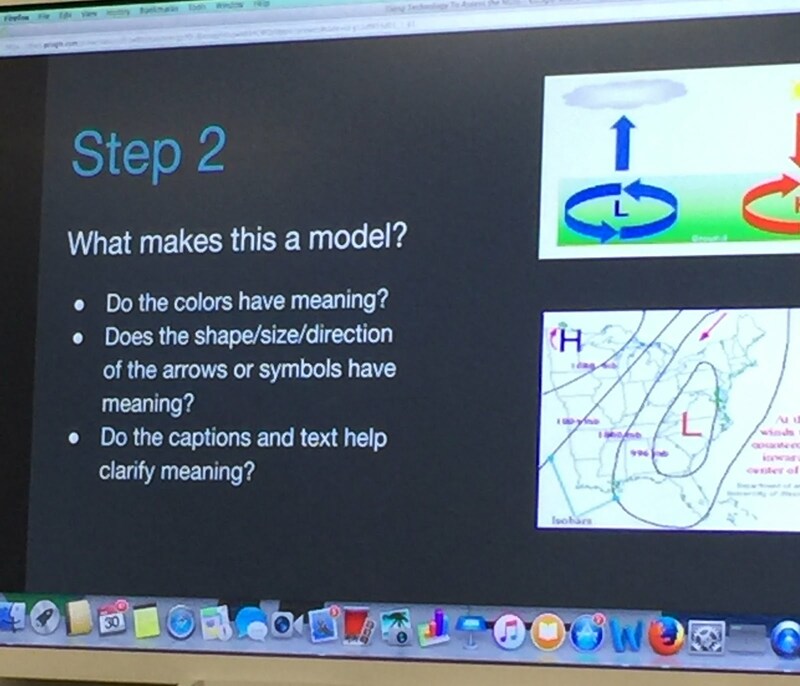 I was amazed at the student's innovative idea to make the video interactive. As you watch the virtual tour, you can click on any of the staff in the video, you'll be connected to a separate YouTube video of that person telling a little bit about themselves and the school. What a great idea! Creative problem-solvers right there! 2) I was inspired by teachers! 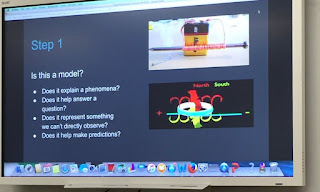 A fourth grade science teacher shared how she taught students to use models of work to demonstrate understanding and critical thinking related to the NGSS standards. She realized that the traditional paper and pencil tests she gave in the past failed to reveal gaps in students' understanding. 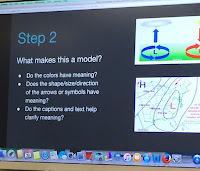 After carefully scaffolding instruction to teach the criteria for a good model, she gave students choice in how to create their own models using such apps as Explain Everything. Not only were these assessments more creative, by offering choice and integrating technology, they also helped her to better target students' learning needs. Always striving to improve her practice, at the end of the workshop she invited participants to give her feedback and share their own examples. It was a great exchange of ideas. 3) I was inspired by the Keynote speakers! 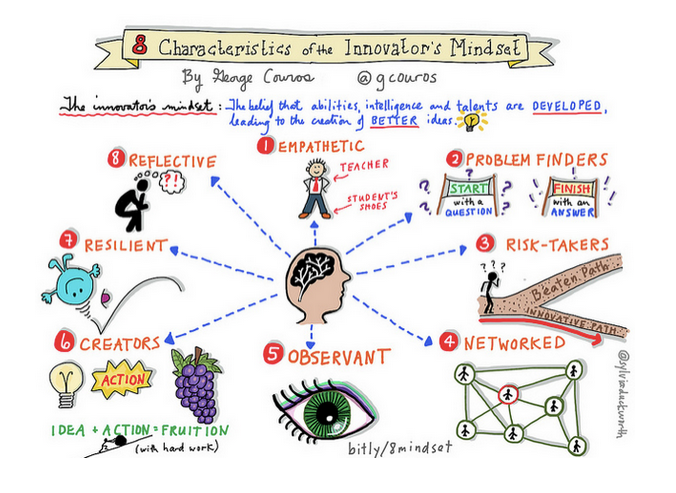 Jenny Magiera and George Couros. George Couros inspired us by sharing numerous examples of what characterizes an "Innovator's Mindset." He challenged our thinking, insisting that this "mindset is necessary for all of us if schools are to move forward." To learn more, check out his new book The Innovator's Mindset: Empower Learning, Unleash Talent, and Lead a Culture of Creativity. 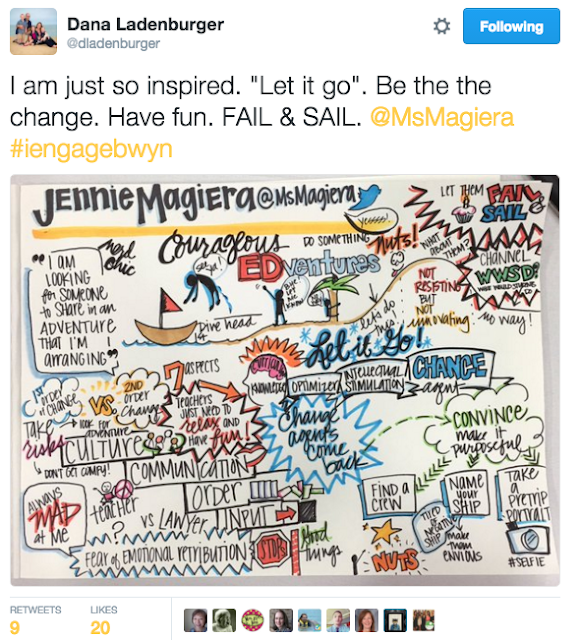 The key ideas are captured in his sketchnote designed by Slyvia Duckworth. 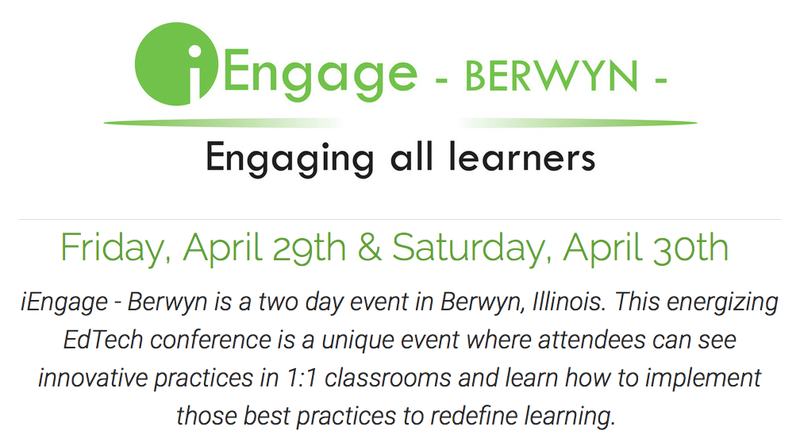 For more of an idea of what the two-day conference event looked like, check out #iengagebwyn on Twitter. I'd like to end this post with a shout out to Shannon Osheroff and Jordan Garrett, two innovative educators whom I met at Apple events during the last year. Shannon first conceived of and planned the conference last year, and Jordan took on a lead role in planning this year's event. Together with an amazing team of students, teachers and administrators from District 100 they planned a great day of shared learning!